Martin Luther (1483-1546) has long been famous for founding the Protestant Reformation and the Lutheran church. For his defiance of Catholic supremacy, Luther is often upheld as a defender of free speech and religious tolerance. Few ideas could be further from the truth. What Luther advocated was the replacement of Catholic religious persecution and oppression with Protestant religious persecution and oppression. He demanded strict obedience to temporal authorities, and he preached that heretics be executed. These views very specifically included other Christians, such as Baptists. Luther was also consumed by a hatred for the Jews, as many of the quotes below make clear. Indeed, prior to the horror of Kristallnacht in 1938 it could be said that Hitler's views on the Jews were actually more moderate than Luther's. In fact Kristallnacht took place on Luther's birthday. 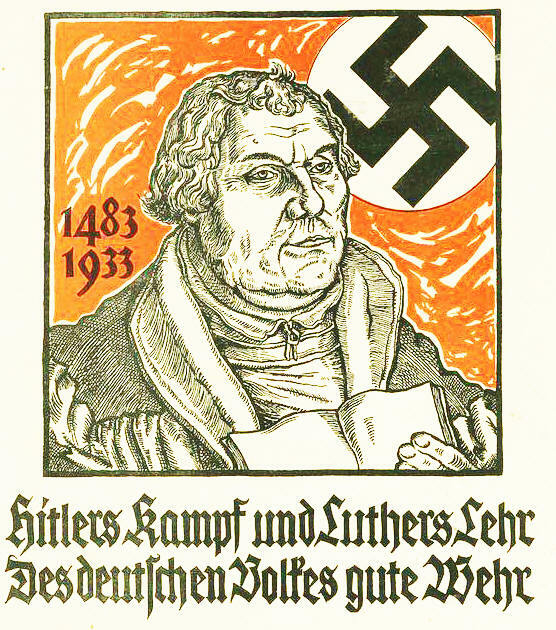 Hitler and the Nazis repeatedly presented Luther as a role model. It was Luther, not Hitler, who first called for burning down all the synagogues of Germany and herding the Jews into slave labor concentration camps. Luther set in motion an economic and political revolution in Renaissance Germany. By breaking with Rome, German states were able to seize the vast wealth of church assets in Germany. The huge profits this produced inspired Henry VIII to adopt similar tactics with similar lucrative results for the English state. Thanks to Luther the structure of the church in Germany shifted to the control of the German states in place of the Church. This would have major implications in Nazi Germany since it meant that Lutheran pastors got their paychecks from the state. We want to stress that Luther in no way endorsed the racial mass murder of Jews, and today we do not see many Lutherans sharing Luther's views of Jews. However, the connection of Luther to Hitler is real and cannot be separated from his legacy. The following quotes speak for themselves. Fourth, I advise that their rabbis be forbidden to teach henceforth on pain of loss of life and limb. For they have justly forfeited the right to such an office by holding the poor Jews captive with the saying of Moses (Deuteronomy 17 [:10 ff.]) in which he commands them to obey their teachers on penalty of death, although Moses clearly adds: "what they teach you in accord with the law of the Lord." Those villains ignore that. They wantonly employ the poor people's obedience contrary to the law of the Lord and infuse them with this poison, cursing, and blasphemy. Fifth, I advise that safe-conduct on the highways be abolished completely for the Jews. For they have no business in the countryside, since they are not lords, officials, tradesmen, or the like. Let they stay at home. Seventh, I commend putting a flail, an ax, a hoe, a spade, a distaff, or a spindle into the hands of young, strong Jews and Jewesses and letting them earn their bread in the sweat of their brow, as was imposed on the children of Adam (Gen 3:19). For it is not fitting that they should let us accursed Goyim toil in the sweat of our faces while they, the holy people, idle away their time behind the stove, feasting and farting, and on top of all, boasting blasphemously of their lordship over the Christians by means of our sweat. No, one should toss out these lazy rogues by the seat of their pants." On the Jews and Their Lies (1543) pgs.63-65.
" ... Eject them forever from this country. For, as we have heard, God's anger with them is so intense that gentle mercy will only tend to make them worse and worse, while sharp mercy will reform them but little. Therefore, in any case, away with them!" On the Jews and Their Lies (1543) p.65. "I have come to the conclusion that the Jews will always curse and blaspheme God and his King Christ, as all the prophets have predicted. He who neither reads nor understands this, as yet knows no theology, in my opinion. And so I presume the men of Cologne cannot understand the Scripture, because it is necessary that such things take place to fulfill prophecy. If they are trying to stop the Jews blaspheming, they are working to prove the Bible and God liars." "I had made up my mind to write no more either about the Jews or against them. But since I learned that those miserable and accursed people do not cease to lure to themselves even us, that is, the Christians, I have published this little book, so that I might be found among those who opposed such poisonous activities of the Jews and who warned the Christians to be on their guard against them. I would not have believed that a Christian could be duped by the Jews into taking their exile and wretchedness upon himself. " On the Jews and Their Lies (1543) p.1. "Our Lord also calls them a 'brood of vipers'; furthermore in John 8 [:39,44] he states: 'If you were Abraham's children ye would do what Abraham did. ... You are of your father the Devil. It was intolerable to them to hear that they were not Abraham's but the Devil's children, nor can they bear to hear this today." On the Jews and Their Lies (1543) p.3. "Be on your guard against the Jews, knowing that wherever they have their synagogues, nothing is found but a den of devils in which sheer self-glory, conceit, lies, blasphemy, and defaming of God and men are practiced most maliciously and veheming his eyes on them." On the Jews and Their Lies (1543) p.18. "They are nothing but thieves and robbers who daily eat no morsel and wear no thread of clothing which they have not stolen and pilfered from us by means of their accursed usury. Thus they live from day to day, together with wife and child, by theft and robbery, as arch-thieves and robbers, in the most impenitent security." On the Jews and Their Lies (1543) p.51. "Whoever wants to be a Christian must be intent on silencing the voice of reason." Source: Martin Luther, "Sermons on the Gospel of St. John," in Works, Vol. 23, p. 99. "Whoever wishes to be a Christian, let him pluck out the eyes of his reason." Source: Martin Luther, "Lectures on the First Psalm," in Works, Vol. 11, p.285. "Christ wants to slay reason and subdue the arrogance of the Jews." Source: Martin Luther, "Sermons on the Gospel of St. John," in Works, Vol. 22, p.320. "The law is the Word in which God teaches and tells us what we are to do and not to do, as in the Ten commandments. ... The Law of God convinces us by our experience that we are naturally wicked, disobedient, lovers of sin, and enemies of God's commandments." "That seditious articles of doctrine should be punished by the sword needed no further proof. For the rest, the Anabaptists hold tenets relating to infant baptism, original sin, and inspiration, which have no connection with the Word of God, and are indeed opposed to it. ... Secular authorities are also bound to restrain and punish avowedly false doctrine ... For think what disaster would ensue if children were not baptized? ... Besides this the Anabaptists separate themselves from the churches ... and they set up a ministry and congregation of their own, which is also contrary to the command of God. From all this it becomes clear that the secular authorities are bound ... to inflict corporal punishment on the offenders ... Also when it is a case of only upholding some spiritual tenet, such as infant baptism, original sin, and unnecessary separation, then ... we conclude that ... the stubborn sectaries must be put to death." "It is a duty to suppress the Pope by force." "There are others who teach in opposition to some recognised article of faith which is manifestly grounded on Scripture and is believed by good Christians all over the world, such as are taught to children in the Creed. ... Heretics of this sort must not be tolerated, but punished as open blasphemers. ... If anyone wishes to preach or to teach, let him make known the call or the command which impels him to do so, or else let him keep silence. If he will not keep quiet, then let the civil authorities command the scoundrel to his rightful master, namely, Master Hans [i.e., the hangman]." "Heresiarchs ... remain obdurate in their own conceit. They allow none to find fault with them and brook no opposition. This is the sin against the Holy Ghost for which there is no forgiveness." "I am on the heels of the Sacramentaries and the Anabaptists; ... I shall challenge them to fight; and I shall trample them all underfoot." "Men despise the Evangel and insist on being compelled by the law and the sword." "Even though they do not believe, they must nevertheless ... be driven to the preaching, so that they may at least learn the outward work of obedience." "It is our custom to affright those who ... fail to attend the preaching; and to threaten them with banishment and the law. ... In the event of their still proving contumacious, to excommunicate them ... as if they were heathen." "Although excommunication in Pope-dom has been shamefully abused ... yet we must not suffer it to fall, but make right use of it, as Christ commanded." "The spiritual powers ... also the temporal ones, will have to succumb to the Gospel, either through love or through force, as is clearly proved by all Biblical history." THE GOSPEL IS A SWORD! "If you understand the Gospel rightly, I beseech you not to believe that it can be carried on without tumult, scandal, sedition. ... The word of God is a sword, is war, is ruin, is scandal." "The Word of God can never be advanced without whirlwind, tumult, and danger ... One must either despair of peace and tranquility or else deny the Word. War is of the Lord who did not come to send peace. Take care not to hope that the cause of Christ can be advanced in the world peacefully and sweetly, since you see the battle has been waged with his own blood and that of the martyrs." "If we punish thieves with the yoke, highwaymen with the sword, and heretics with fire, why do we not rather assault these monsters of perdition, these cardinals, these popes, and the whole swarm of the Roman Sodom, who corrupt youth and the Church of God? Why do we not rather assault them with arms and wash our hands in their blood?" "All the strife and the wars of the Old Testament prefigured the preaching of the Gospel which must produce strife, dissension, disputes, disturbance. Such was the condition of Christendom when it was at its best, in the times of the apostles and martyrs. That is a blessed dissension, disturbance, and commotion which is produced by the Word of God; it is the beginning of true faith and of war against false faith; it is the coming again of the days of suffering and persecution and the right condition of Christendom." "What wonder if princes, nobles and laity should smite the heads of the pope, bishops, priests, and monks, and drive them from the land?" According to the Scriptures such fear and anxiety come upon the enemies of God as the beginning of their destruction. Therefore it is right, and pleases me well, that this punishment is beginning to be felt by the papists who persecute and condemn the divine truth. They shall soon suffer more keenly ... Already an unspeakable severity and anger without limit has begun to break upon them. The heaven is iron, the earth is brass. No prayers can save them now. Wrath, as Paul says of the Jews, is come upon them to the uttermost. God's purposes demand far more than an insurrection. As a whole they are beyond the reach of help ... The Scriptures have foretold for the pope and his followers an end far worse than bodily death and insurrection ..."
We have no one on earth to thank for this mischievous rebellion, except you princes and lords; and especially you blind bishops and mad priests and monks ... since you are the cause of this wrath of God, it will undoubtedly come upon you, if you do not mend your ways in time. ... The peasants are mustering, and this must result in the ruin, destruction, and desolation of Germany by cruel murder and bloodshed, unless God shall be moved by our repentance to prevent it. For you ought to know, dear lords, that God is doing this because this raging of yours cannot and will not and ought not be endured for long. You must become different men and yield to God's Word. If you do not do this amicably and willingly, then you will be compelled to it by force and destruction. If these peasants do not do it for you, others will. ... It is not the peasants, dear lords, who are resisting you; it is God Himself. ... To make your sin still greater, and ensure your merciless destruction, some of you are beginning to blame this affair on the Gospel and say it is the fruit of my teaching. ... You did not want to know what I taught, and what the Gospel is; now there is one at the door who will soon teach you, unless you amend your ways. They are starting a rebellion, and violently robbing and plundering monasteries and castles which are not theirs, by which they have a second time deserved death in body and soul, if only as highwaymen and murderers ... if a man is an open rebel every man is his judge and executioner, just as when a fire starts, the first to put it out is the best man. For rebellion is not simple murder, but is like a great fire, which attacks and lays waste a whole land. Thus rebellion brings with it a land full of murder and bloodshed, makes widows and orphans, and turns everything upside down, like the greatest disaster. Therefore let everyone who can, smite, slay, and stab, secretly or openly, remembering that nothing can be more poisonous, hurtful, or devilish than a rebel. It is just as when one must kill a mad dog; if you do not strike him, he will strike you, and a whole land with you. ... They cloak this terrible and horrible sin with the Gospel, call themselves "Christian brethren." ... Thus they become the greatest of all blasphemers of God and slanderers of His holy Name, serving the devil, under the outward appearance of the Gospel, thus earning death in body and soul ten times over. ... Fine Christians these! I think there is not a devil left in hell; they have gone into the peasants. Their raving has gone beyond all measure. I will not oppose a ruler who, even though he does not tolerate the Gospel, will smite and punish these peasants without offering to submit the case to judgment. ... If anyone thinks this too hard, let him remember that rebellion is intolerable and that the destruction of the world is to be expected every hour." "If God permits the peasants to extirpate the princes to fulfil his wrath, he will give them hell fire for it as a reward." "My opinion is that it is better that all the peasants be killed than that the princes and magistrates perish, because the rustics took the sword without divine authority. The only possible consequence of their satanic wickedness would be the diabolic devastation of the kingdom of God. Even if the princes abuse their power, yet they have it of God, and under their rule the kingdom of God at least has a chance to exist. Wherefore no pity, no tolerance should be shown to the peasants, but the fury and wrath of God should be visited upon those men who did not heed warning nor yield when just terms were offered them, but continued with satanic fury to confound everything. ... To justify, pity, or favor them is to deny, blaspheme, and try to pull God from heaven." "All my words were against the obdurate, hardened, blinded peasants, who would neither see nor hear, as anyone may see who reads them; and yet you say that I advocate the slaughter of the poor captured peasants without mercy. ... On the obstinate, hardened, blinded peasants, let no one have mercy. See, then, whether I was not right when I said, in my little book, that we ought to slay the rebels without any mercy. I did not teach, however, that mercy ought not to be shown to the captives and those who have surrendered." It is very important to understand that the Nazi book burning campaigns organized in 1933 were very specifically inspired by Luther's book burning ceremony on December 10, 1520. Luther also inspired the book burning festival at the Wartburg in 1817 by German nationalists.